The yellow metal reversed sharply, falling $10 from yesterday’s highs to hit two days lows after reaching $1318 per ounce, which is the highest level since the beginning of the month. The move to the downside took place on the back of a stronger US Dollar across the board as the DXY rebounded above the 97 handle. Softer than expected European and UK economic data, weighed on the Euro and Sterling and in turn Gold prices followed. Growth prospects around the globe remain weak and the greenback seems to be gaining its allure as a safe haven again. Gold prices reached the 1318 level before sharply reversing to end the day in red as bearish pressure continues to intensify. 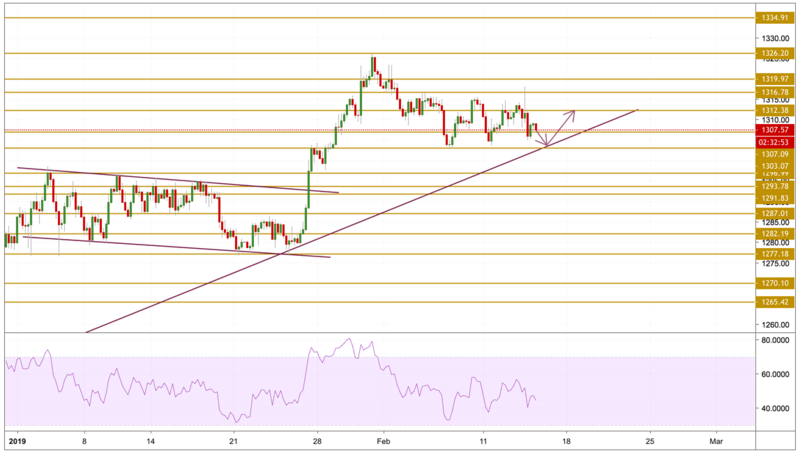 The price is currently facing the support level $1307.09 and we expect the continuation of the sideways price action unless the purple trend line presented on the chart gets violated to the downside. We will be focusing on the same range and mainly on the 1312.4 resistance level.